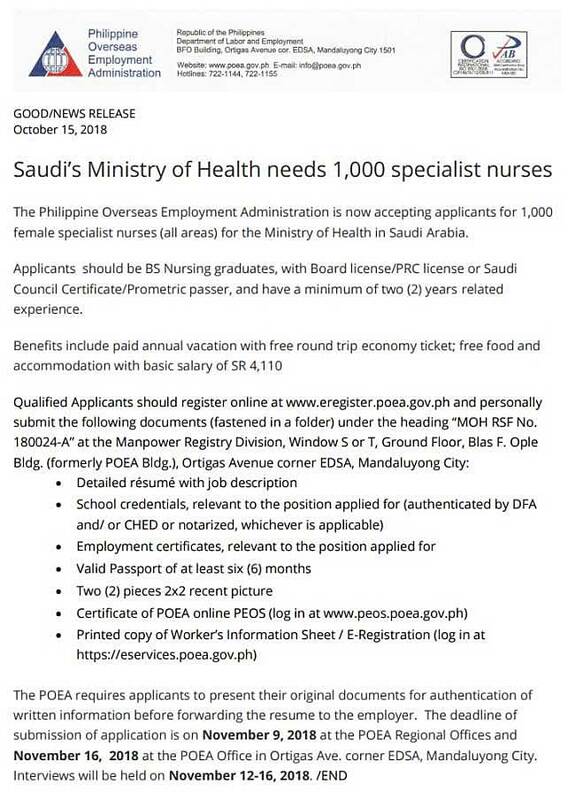 Filipino Nurses who are interested to work abroad particularly in Saudi Arabia, can apply directly to POEA. Saudi Ministry of Health is in need of 1000 specialist female nurses in all areas. 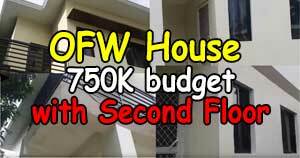 Salary is around 59000 pesos per month plus other employment benefits. In order to be qualified, applicants should be a graduate of Bachelor of Science in Nursing and have passed the PRC licensure exam for Nursing, or Saudi Council Certificate holder / Prometric passer. These job openings are open to Filipino nurses (all areas) that have work experience of at least 2 years in the related field. Those who will be hired will receive a monthly basic salary of SR 4,110 or roughly 59000 Pesos. Employment benefits include free food, free accommodation, and paid annual vacation with free round-trip economy class airplane ticket. 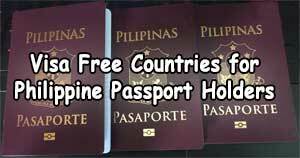 I suggest that you verify with POEA the details of free food and free accommodation. There is no manpower agency involved as the application is submitted directly to POEA main and/or regional offices. After authentication and verification, POEA will then submit your application directly to the employer. 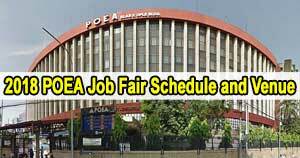 Qualified applicants can begin processing their application by registering online at the official website of POEA www.eregister.poea.gov.ph. Afterward, they need to submit the required documents fastened in a folder with heading “MOH RSF No. 180024-A at the Windows S or T of the Manpower Registry Division located at the Ground Floor of Blas F. Ople building in Ortigas Avenue cor EDSA Mandaluyong City. Take note that all the required documents must be submitted in person. Applicants must also bring their original documents for verification/authentication purposes before the application will be forwarded to the employer. Applicants can submit their application personally at the POEA regional offices on or before November 9, 2018. They can also submit their application in person at the POEA head office in Ortigas Avenue corner EDSA Mandaluyong City on or before November 16, 2018. Interview will start on November 12 to 16, 2018.